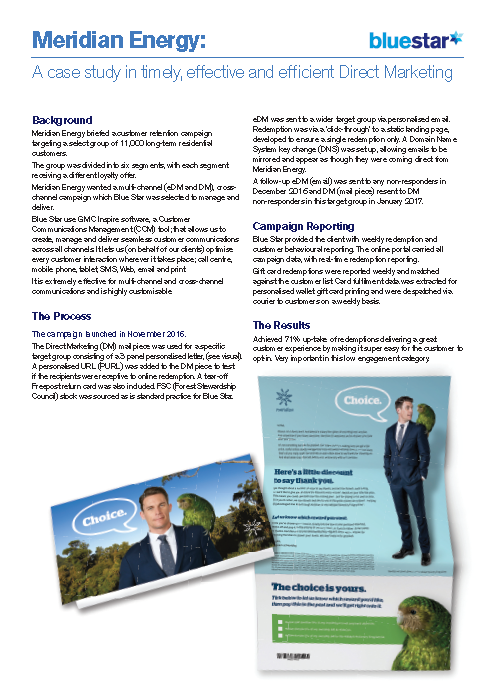 Meridian Energy briefed a customer retention campaign targeting a select group of 11,000 long-term residential customers. The group was divided into six segments, with each segment receiving a different loyalty offer. Meridian Energy wanted a multi-channel (eDM and DM), cross channel campaign which Blue Star was selected to manage and deliver. Blue Star use GMC Inspire software, a Customer Communications Management (CCM) tool; that allows us to create, manage and deliver seamless customer communications across all channels. It lets us (on behalf of our clients) optimise every customer interaction wherever it takes place; call centre, mobile phone, tablet, SMS, Web, email and print. It is extremely effective for multi-channel and cross-channel communications and is highly customisable.